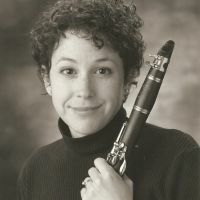 Additional Info: Nancy Gamso, Professor of Music at Ohio Wesleyan University, teaches woodwind instruments, music appreciation, woodwind methods, and history of jazz; directs the woodwind ensemble program. Dr. Gamso performs regularly as an orchestra musician (all woodwinds) with the Broadway series in Columbus, Akron and Cleveland. Nancy has performed at the Sarasota Music Festival, the Lancaster Festival, with the Columbus, Newark-Granville, Central Ohio, Ohio Valley Symphony Orchestras, the Southern Ohio Light Opera, and the New Sousa Band. In collaboration with Assistant Professor of Piano, Dr. Tracy Cowden (Virginia Tech. ), Dr. Gamso released a compact disc recording, With Blackwood and Silver, 20th-century works for flute, clarinet and piano. The recording received favorable reviews in the March 2009 edition of The Clarinet, the journal of the International Clarinet Association.